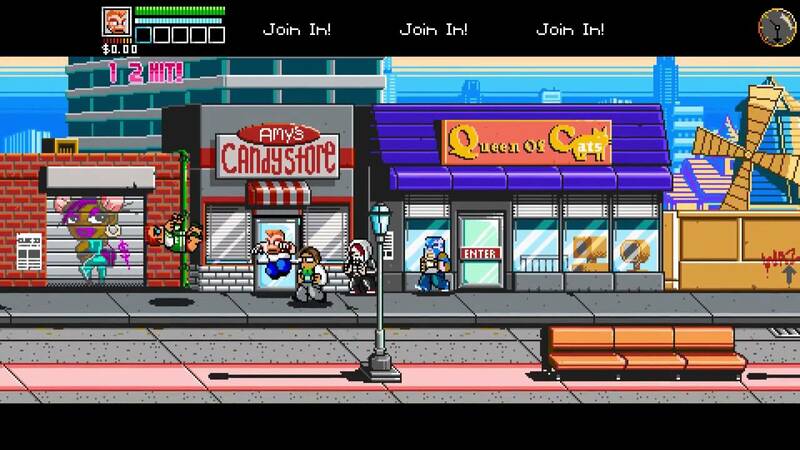 My brain practically exploded when I heard there was going to be a new, main-line River City Ransom game. There have been a few entries into the franchise between here and the original, but none really captured the essence of what RCR is, quite like this one did. It’s a direct sequel to the original, taking place [I believe?] 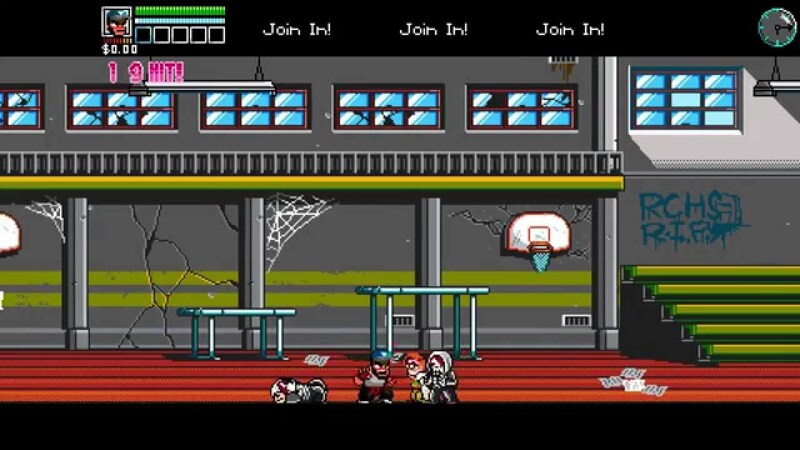 about twenty years later, and begins with you and your friend [if you’re playing co-op] as Alex and Ryan, the titular stars of the original game, cleaning up River City High for good. At least, you think it’s for good, anyway. . .Fast forward to the modern era, where you pick one of the four new characters, each with their own moves, specials, and look. Personally, my favorite is the Shotokan asskicker, Grant. Regardless, you start beating up some of the other gangs on campus in the tutorial, showing you how this game works, while also giving you a taste of the difficulty that RCR:U offers, and eventually the story picks up! As it turns out, your gang is being framed! Not just for stealing lunch money, or stuffing the Nerd Gang into toilets, but kidnapping. The Mayor of River City is offering quite the bounty too, to bring street justice to the perpetrators, and get his girl back. So now, you guys are beset upon on all sides. Every gang is out to get you, just like the original, but now, the cops are involved! You can’t just discriminately beat the piss out of people in this one, or you’ll face the wrath of the law. And the arm of the law is quite long. No matter how many screens you run, they will always spawn [and hilariously do things like mow you down with their car, like they did to Colton, repeatedly on the stream], drop down from Helicopters, et cetera. They will not stop until you can find a way to evade them. Which means, you have to clear a screen of all foes, and either get into a Hideout, or jump into a dumpster! But what triggers these cops? Illegal activity, of course. They don’t just show up for no reason! It’s perfectly fine to kick the teeth off of a gang member, suplex them into a car, pummel them stupid with a baseball bat, play Gang-land catch by throwing them back and forth between teammates, but if you hit a civilian, or break open a parking meter near a civilian, they will call the cops. The meter in the top right, which looks like an alarm from school, will change to a police badge if they’re alerted. 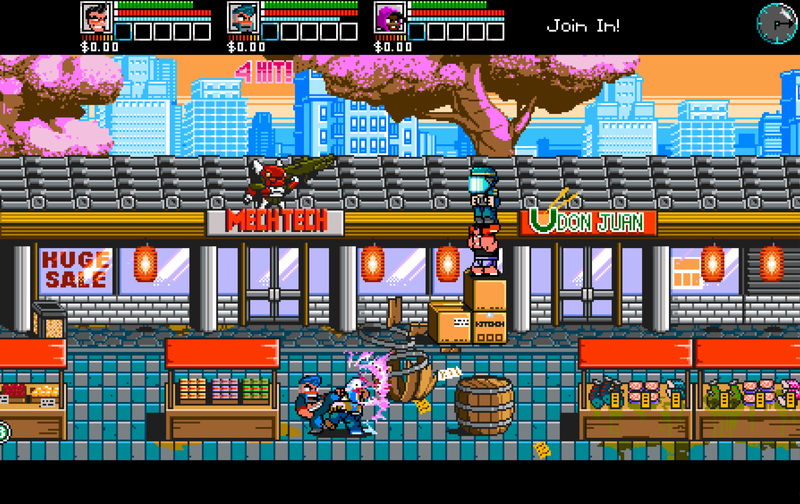 But that aside, this is a side-scrolling, four player online beat ’em up. There are something like twenty characters to unlock, including the original Alex and Ryan, only aged for the current game. We found them by accident while sneaking through the auto club for River City High School. If you help them, and don’t accidentally hit them over and over [like we did], they’ll help you, and when their task is complete, you can select them! We found a few characters, like a grappler, in the cafeteria. However, your levels, and cash all stay with the characters you earned them with, sort of like Scott Pilgrim, which took quite a bit of inspiration from this franchise. It’s very open world, and you can roam pretty much as you please, but I will warn you: This game is not easy. The enemies come in huge packs, and without skill, you will die. And we did! A bunch. Thankfully, in this game, if you leave the screen, your friends respawn, but at a cost: Half of their cash is gone. What do you use money for? Same things as in the previous games! You buy food that you can use to heal you and increase your stats, buy books that increase stats, going to the sauna to increase your health/stamina. There are tons of side-quests, bonus missions, difficult boss fights, and a New Game+ mode, when you’ve done all of that. Not to mention tons of characters to unlock, level, and play online with your friends. This is game I never knew I needed until it was announced. I loved the original, and I appreciate the attention to detail that it pays to the franchise as a whole. 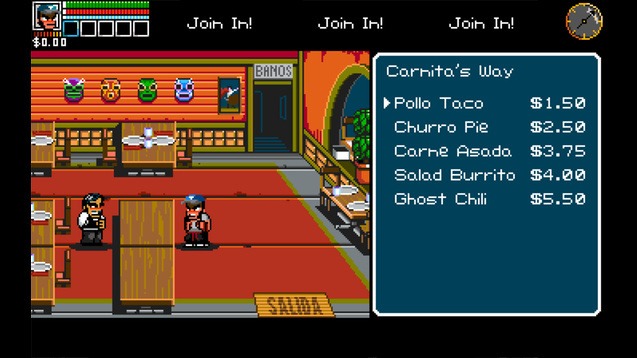 Not only to River City Ransom, but other games that exist in the same universe, like Super Dodge Ball. There’s a small out of the way dodge ball stage, where there are two balls you can throw at each other, or at enemies if there are any there. It’s non-stop, it’s insanely challenging, but even when we were dying [and we were. A lot.] we were having so much fun! It’s rough, you’ll spend a lot of time dying likely, farming money, and going to buy food/trips to the sauna, and unlocking special moves to abuse the other gangs with! Also, Double Dragon’s Abobo is the damn principal! Effing Abobo! If you fight one of the teachers, you get sent to the Principal’s office and have to fight him to get out. Everything about this is a throwback to the past. It’s got the retro look and feel, but with updated sprites that look clean and beautiful. It’s definitely easy to play, hard to master. There’s much to see and do, plenty of challenge, and if you’re a fan of retro gaming, or the River City franchise as a whole, you need this game in your life. Don’t wait! Grab it! It’s River City plus GTA in the absolute best way. Want to see some gameplay from Bottom Tier? Below is our live stream!